We'll help you take your hockey and academic skills to the next level. Thanks for checking out the Yorkton Terrier Junior A Hockey Club, our community, and the Saskatchewan Junior Hockey League as you prepare to make a decision about your future for the next few years. Our goal is simple... we want to provide you with opportunities to go the next level, as a player, as a student, and as a person. We are looking for quality young men who believe that being part of a strong and cohesive team will help them develop their skills and their personality. Like the Terriers, the league believes in development of players and students. The Terriers and the league operate in a competitive environment where skill and dedication are needed to succeed in the league, and beyond in interprovincial and national Royal Bank Cup competition. Our graduating players in recent years have gone on to play at the Ferris State University, University of Lake Superior State, Union College, University of Minnesota-Duluth, Rochester Institute of Technology, University of Minnesota, Brandon (MB) University, University of Regina, Holy Cross University, University of Alaska, Princeton University, Southern Alberta Institute of Technology, other colleges throughout the United States, and on minor pro league teams in the U.S.
Coming off a great season that saw the Terriers be crowned National Champions in Vernon, BC in May 2014. We are looking for players who want to learn and develop, who have the dedication to succeed, and who will be proud to wear the Terrier crest on their chest in a community where Terrier hockey is the major focus from fall to spring. The community of Yorkton, the Terrier organization, and our players are looking forward to living our dreams together! Saskatchewan Junior Hockey League web site: www.sjhl.ca. Mat returns for his second season with the Yorkton Terriers. He joined the Terriers in November 2016 after resigning from his former position of Associate Coach and Associate GM with the La Ronge Ice Wolves. He was recently named Head Coach/ General Manager after the departure of Casey O'Brien. From Sherwood Park, Alberta, Mat played junior hockey with the Sherwood Park Crusaders for three seasons, serving as Alternate Captain in his last season. After junior hockey, he played four years for Fredonia State University in the NCAA Division 3. He studied Sports Management at Fredonia State. After his playing career was over, Mat stayed in New York and coached at SUNY Canton in the NCAA Division 3 level, before moving back to Canada and joining the La Ronge Ice Wolves for the 2015-16 season. Mat now resides in Yorkton, Saskatchewan. He currently has his Hockey Canada High Performance 1 certification. He was named Video Coach with the Saskatchewan Under 16 Team in April and will be with the team in various times throughout the summer and fall months. The Terriers play a 58-game schedule from mid September through early March in the 12-team SJHL. The league playoffs begin in March and end in mid to late-April with the SJHL Canalta Cup being awarded to the League Champion. The League Champion moves on to play the MJHL Champion in a best of seven series for the Anavet Cup. The winner of the Anavet Cup will move on to be a Western Canada representative at the RBC Cup. The Anavet Cup makes its return for the 2017-18 season after a five hiatus from the Western Canada Cup. The Western Canada Cup replaced the Anavet Cup in the 2012-13 season. The Western Canada Cup was the Western Canada qualifier for the National Championship. The BCHL, AJHL, SJHL and MJHL Champions will all participate in the WCC along with the host team. The two top teams after the WCC play down advanced to the National Junior “A” Championship, the RBC Royal Bank Cup. The four leagues rotated every four years for hosting the WCC. The Nanaimo Clippers of the BCHL hosted the inaugural event in April 2013. The Dauphin Kings of the MJHL hosted in April 2014 where the Terriers won the WCC. The Estevan Bruins of the SJHL recently hosted the 2016 WCC. This season the Pentiction Vees of the BCHL will be hosted the fifth and final WCC in April 2017 in Penticton, BC. The SJHL has enjoyed a great deal of success on the intra provincial and national level, winning the ANAVET CUP twenty-six times in its thirty-four year existence. At the Royal Bank Cup Championship the SJHL traditionally has done very well. Humboldt (2003), Weyburn (2005),Humboldt (2008) and Yorkton (2014) have all won the event in recent years with Yorkton (2006) and Kindersley (2004) finishing as national finalists. The Terriers average three games a week, participiate in dryland training, and have practices the mornings of all non-game days. The hockey club supplies players with all outer equipment (helmets, sticks, gloves, pants, socks and jerseys), and gets great discounts on all other equipment needed by the players. Because of Yorkton's central location, most road trips are less than three hours. While on the road, the Terriers use a state-of-the-art charter bus fully equipped with VCRs, TVs, CD players and washroom facilities. The Yorkton Terrier Hockey Club is operated by a community-owned not-for-profit organization under the leadership of a volunteer board of directors elected at the annual meeting. The hockey club and its hundreds of volunteers carry out extensive fund-raising projects to support the team and its players. Home for the Terriers is the Farrell Agencies Arena in the Gallagher Centre, Yorkton's newly renovated and expanded recreation complex. Along with the arena, the Centre houses an indoor lane swimming pool with waterslide and leisure water recreation areas, sauna, hot tub, meeting and convention facilities, a fieldhouse used for soccer, volleyball, track, trade shows, entertainment events and more, and an eight-sheet curling club. The Terriers have their own dressing room, training room/player lounge, skate sharpening, offices for coaching and administration staff, and a popular souvenir shop in the main lobby. Free gym memberships are provided to the players at a downtown facility. Full room and board is provided at the expense of the hockey club and at no cost to the players. Players are billeted with host families within Yorkton, who have been screened by the team to ensure the players have a good home. Players without vehicles are billeted with teammates who do, so that rides to and from the rink and school are not a problem. High school classes are available to all players. Yorkton has both a public and a Catholic high school, and both schools have counselors who work closely with the hockey club to ensure that players classes are co-ordinated with game and practice schedules. Tutoring is also available if required. University classes are available through the local regional college. The first two years of university can be completed in Yorkton. Players are reimbursed their tuition fees on successful completion of university classes. Help is also available to prepare players for SAT exams, and NCAA clearinghouse requirements. Terrier and SJHL games are scouted extensively by NCAA colleges, Canadian universities, minor pro and NHL teams. Scouts are provided with player profiles and information by the coaching staff to keep them informed about the accomplishments of players. The Terrier and league web sites also provide player details and stats. 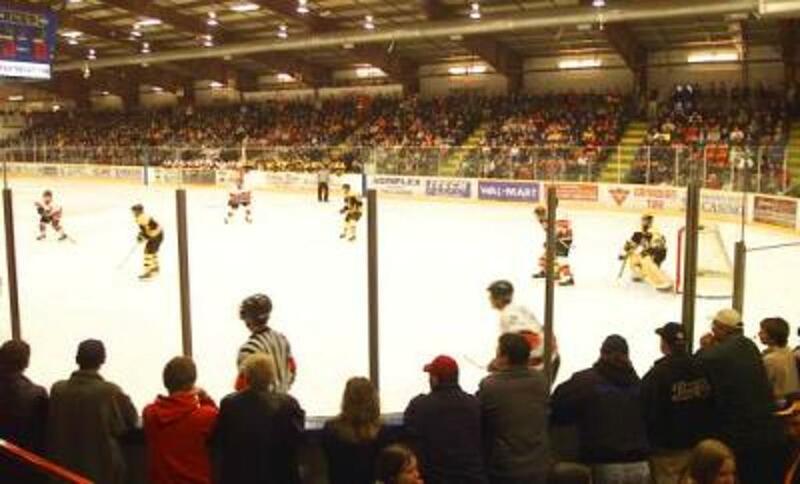 Yorkton, with a population of about 19,000, is the largest centre in the SJHL. It has a large retail trading area of about 200,000 people, which means that all essential stores and services, including big-box stores, are located in the city. It is the largest community on the Yellowhead Highway between Winnipeg (4.5 hours east) and Saskatoon (3.25 hours west). Regina is less than two hours away to the south. The city has ample accommodation facilities, several excellent golf courses in or near the city, and lots of hunting, fishing, camping, hiking, skiing and other outdoor activities at nearby provincial parks. The Gallagher Centre, where the Farrell Agencies Arena is the home of the Terriers, is one of the finest such recreation centres in the province. Yorkton is the media centre for eastern Saskatchewan and western Manitoba, with two local newspapers, two radio stations, television stations, and two cable TV outlets that provide live game broadcasts and extensive coverage of the team and the league.